1 text from dog | This Blog Rules | Why go elsewhere? 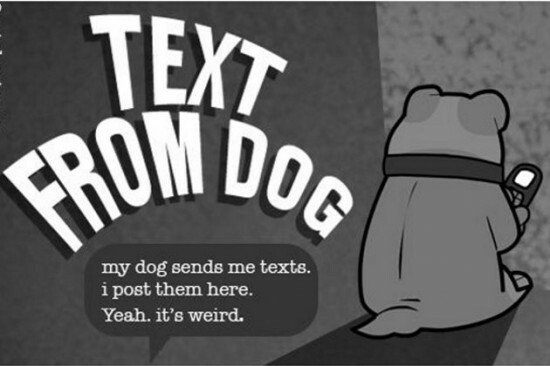 Text from Dog: What if Your Dog Could Text You? If, like me, you own a dog and you care for your dog and you feed it and you play with it and you clean up its poop, then you may have at one point or another wondered what it would be like if your dog could talk. Admittedly, most dogs’ talking points would simply be, “feed me,” “lemme out” and “pick up my poop,” but what if your dog could speak of something other than their baser urges, like Brian from Family Guy? A hilarious and imaginative tumblr account called Text from Dog imagines such a thing, and takes it one step further: what if your dog had a cell phone and could text you? The blog, created three months ago, posts the conversations between a dog and its owner (October Jones), as captured by the owner’s iPhone. The name of the mischievous mutt featured in the blog has no known name (although it appears to have opposable thumbs), but the owner’s twitter account shows that it is a bulldog.